In my previous post, we explored the way to identify list of group policies linked to a particular Active Directory OU. While it serves the purpose, there are few details missing there like whether GPO is enabled, enforced, what is the order of the GPO, etc. The applicability of Group Policy object on an Active Directory OU completely replies on status of Group Policy link on that OU. If the status of Group Policy link is in enabled state, then policy will get applied. If the status is disabled, policy is not applicable for members inside that OU. Below screen shot shows the link enable status of a Group Policy on LAB OU from GPMC editor. When the GPO link is disabled, it appears like below in GPMC editor. Similarly enforced option has its significance to decide policy applicability. 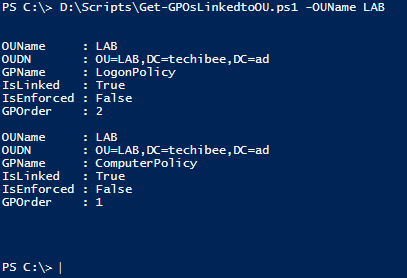 In my previous post, I used a property called LinkedGroupPolicyObjects to retrieve list of linked Group Policies on OU. There is another property called gPLink which gives more details about the policy that is linked. The values inside gPlink property talks about list of policies, their order, link enable status, enforce status. The format of gplink property looks like below. The below script take a OU name, searches active directory for OUs having that name, queries the group policies linked to that OU, identifies link status, enforcement status, order details and returns the information in Object format. The output is easy to understand. It mentions about OU name, its DN, policy name, link status, enforcement status, and order of the GPO that you see in GPMC console. Hope this helps.. stay tuned for more articles in future. why don´t reverse the array? You mean instead of using $order variable? Yes, your suggestion works as well.